Setup Area: needs to be a level area with nearby access to electrical outlet. We provide a small table to set machine. The smell of fresh popcorn will attract a crowd at your next party, movie night, or festival! 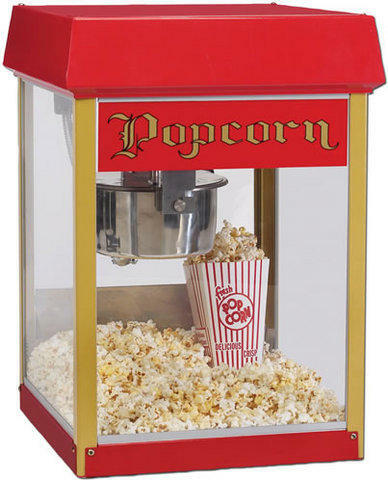 Popcorn machines are easy to operate and conveniently operate on a 110-volt regular circuit. Features a swing out door and warming lamp to keep popcorn ready to serve. Supplies sold separately here, we recommend using our Gold Medal packets for best results and flavor. $10 off your concession machine rental, when you order together with any inflatable! Enter coupon code FUNFOODS at checkout!